There is no cure for Alzheimer’s disease and it is usually diagnosed when it is too late for an effective intervention. It begins long before patients show typical symptoms like memory loss. Gerwert and colleagues have developed a blood test for Alzheimer’s disease which can detect early indicators of the disease long before the first symptoms appear in patients. The blood test would thus offer an opportunity to identify those at risk and may thereby open the door to new avenues in drug discovery. The research is published today in EMBO Molecular Medicine. 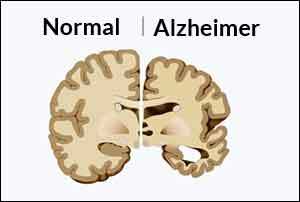 One of the hallmarks of Alzheimer’s disease is the accumulation of amyloid-beta plaques in the patient’s brain. The blood test, developed by Klaus Gerwert and his team at Ruhr University Bochum, Germany, works by measuring the relative amounts of a pathological and a healthy form of amyloid-β in the blood. The pathological form is a misfolded version of this molecule and known to initiate the formation of toxic plaques in the brain. Toxic amyloid-beta molecules start accumulating in the patients’ body 15-20 years before disease onset. In the present study, Gerwert and colleagues from Germany and Sweden addressed whether the blood test would be able to pick up indications of pathological amyloid-beta in very early phases of the disease. The researchers first focused on patients in the early, so-called prodromal stages of the disease from the Swedish BioFINDER cohort conducted by Oskar Hanson. They found that the test reliably detected amyloid-beta alterations in the blood of participants with a mild cognitive impairment that also showed abnormal amyloid deposits in brain scans. Currently available diagnostic tools for Alzheimer’s disease either involve expensive positron emission tomography (PET) brain scans or analyze samples of cerebrospinal fluid that are extracted via lumbar puncture. The researchers suggest that their blood test serves as a cheap and simple option to pre-select individuals from the general population for further testing by these more invasive and costly methods to exclude the falsely positive subjects.The blood test developed by Gerwert and colleagues uses a technology called immuno-infrared sensor to measure a distribution of pathological and healthy structures of amyloid-beta. The pathological amyloid-beta structure is rich in a sticky, sheet-like folding pattern that makes it prone to aggregation, while the healthy structure is not. The two structures absorb infrared light at a different frequency, allowing the blood test to determine the ratio of healthy to pathological amyloid-beta in the sample. The blood test will be extended to Parkinson disease by measuring another disease biomarker – alpha-synuclein – instead of amyloid-beta.